Emily Holcombe presenting deeds of Gold Street to Mayor Miles B. Preston, Hartford. Emily Seymour Goodwin Holcombe was an activist and preservationist who took pride in the state’s history, particularly its colonial past. From the 1890s through the early 20th century, Holcombe organized numerous preservation efforts, including the restoration of Hartford’s Ancient Burying Ground and the preservation of Connecticut’s Old State House. Born in Bristol in 1852, Holcombe spent her youth in Brooklyn Heights, N.Y., surrounded by numerous relocated Connecticut natives who came to New York in search of new opportunities. Her heart was never far from Connecticut, however, and she often spent her summers back in Bristol. The preservation efforts she undertook as an adult stemmed from a popular cultural movement known as the Colonial Revival. The Colonial Revival was an American response to the rapid change brought on by industrialization in the late 19th and early 20th centuries. It encouraged appreciation for what citizens of that age imagined were simpler times and sought to “Americanize” a rapidly diversifying population through exposure to a re-incarnation of the country’s moral and patriotic roots. In 1892, Holcombe organized the Ruth Wyllys Chapter of the Daughters of the American Revolution, serving as its regent until 1903. In 1896, the chapter voted to restore Hartford’s Ancient Burying Ground. 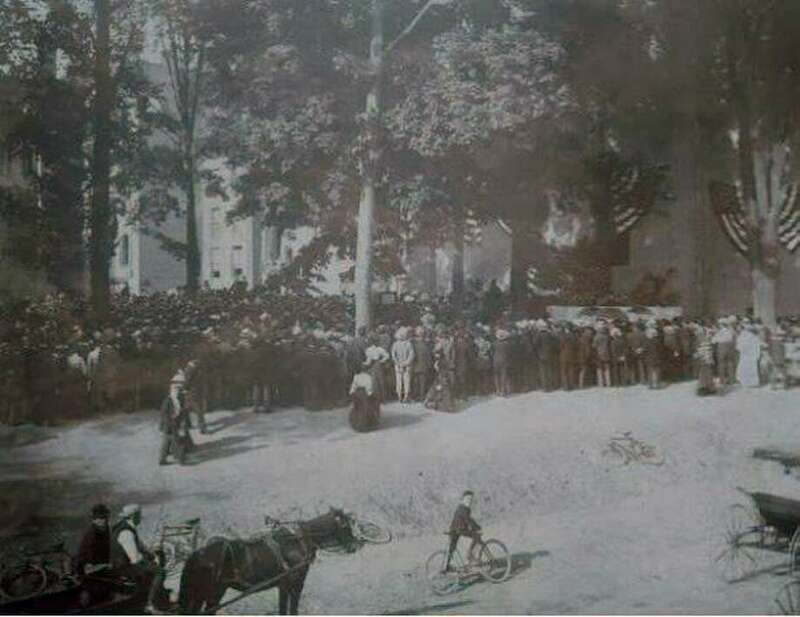 Through the DAR, Holcombe managed to raise enough funds not only to preserve the cemetery but also to demolish some surrounding buildings and widen Gold Street, which ran past the graveyard. Holcombe’s preservation efforts moved into the 20th century when, in 1903, a descendant of Chief Justice Oliver Ellsworth of Windsor donated his house to the DAR. Holcombe led the effort to equip the house with antique furniture. The following year, she helped create the Connecticut Building at the Louisiana Purchase Exposition. The year the Ruth Wyllys Chapter of the Daughters of the American Revolution voted to restore Hartford’s Ancient Burying Ground. More than just saving buildings, Holcombe concerned herself with shaping Connecticut’s identity.